While Activision incorporates subtitles in the general gameplay of the remastered game – as you run around, chase sheep, breathe fire, save the world, and so on – animated cut-scenes don't have them. The publisher pointed to the amount of work it had put in to localizing the game into various different languages, but seems to have paid less attention to the usual accessibility standards – meaning that deaf or hard-of-hearing players will have a harder time following, or indeed enjoying, the loving work put into the game. The accessibility failure hasn't gone unnoticed. While there's no legal requirement to include subtitles, it's certainly usual practice, and is what we'd expect of a major publisher in 2018. 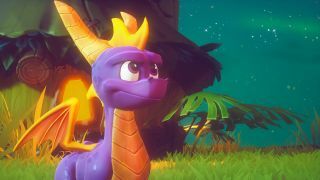 In a statement to GamePitt, Activision said it "remained committed to keep the integrity and legacy of Spyro that fans remembered intact", and would "evaluate going forward". So, could we see subtitles added in a later patch? The similar omission from Activision's release of the Crash Bandicoot N-Sane Trilogy in 2017 makes it look unlikely. For a remaster created for the series' fans, it's disappointing to say the least.